This 2014 Chevrolet Impala comes with a secret compartment in the dash that’s revealed when the touchscreen slides up. The compartment even includes an USB outlet for charging phones and accessories. 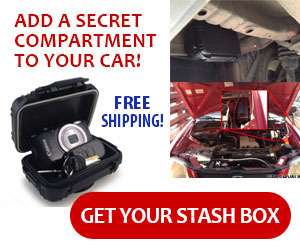 Summit Racing carries this lockable steel box that mounts under a truck seat to secure guns, weapons or other valuables. The drawer comes with keys and attached tabs that can be used to bolt it to the floor. Norman Gurley was pulled over for speeding. The officer saw wires leading to a secret compartment on Gurley’s truck. Even though they found no contraband, Norman was arrested just for having a secret compartment in his truck. MotorTrend shows that the 2014 BMW 4 Series cars contain secret compartments under the floor in the center of the trunk. This user on ClubLexus.com found an unused speaker location since his car wasn’t fitted with the Mark Levinson audio system upgrade. He can remove the grill easily with a credit card. He installed a cup in the central dash location to hold anything he wants to keep secret. Police and military vehicles use these secure gun storage drawer compartments to hold guns and supplies.